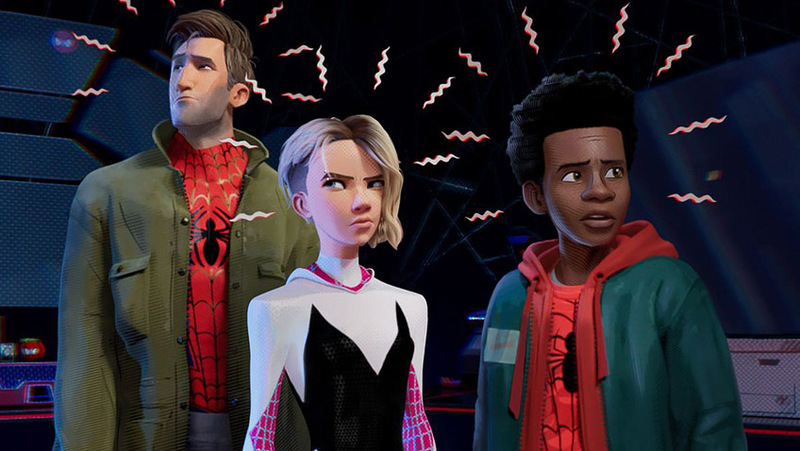 Joyce Glasser reviews Spider-Man: Into the Spider-Verse (December 14, 2018), Cert. PG, 116 mins. Early on, Spider-Man, recognising the repetitive nature of the franchise over the years confesses: ‘But after everything, I love being Spider-Man. No matter how many hits I take, I always think of a way to come back.’ If, by hits, you can read, ‘box office hits’, then this confession takes on a whole new meaning. And sure enough, in Spider-Man: Into the Spider-Verse , Sony Pictures Animation and Marvel Entertainment have figured out a novel way for Spider Man to come back – but this time, he is not alone. 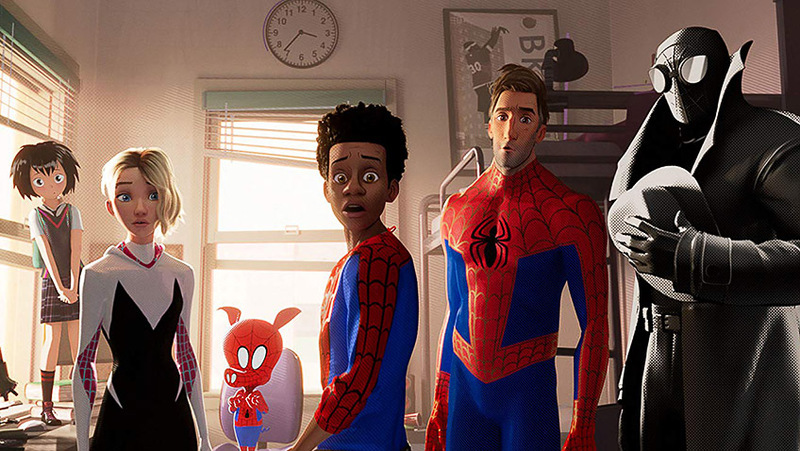 Fun (up to a point), stylish – animated – and creatively ingenious, this Spider-Man has a strong concept, but one that becomes an end in itself, with the plot more concerned with setting up the reboot for spin-offs than for telling a story complete in itself. We saw the success of Marvel Comic’s diversity strategy when Black Panther became the blockbuster to beat in 2018, and now it’s Peter Parker’s turn to hand the title Spider-Man over to Miles Morales (Shameik Moore). The directing was handed over to the trio of Bob Persichetti, Peter Ramsey and Rodney Rothman who co-wrote the script with co-scriptwriter Phil Lord. Lord (who also co-produces) and Rothman worked wonders together with 22 Jump Street, one of the best comic sequels of the millennium, but humour is less important here than the message. The filmmakers appeal to the target ‘Me, Me’ generation with the notion that we can all be Spider-Man. This is a message that even adults can embrace after watching Alex Honnold scale El Capitan – without webs or ropes – in the documentary film Free Solo, also released this week. Not only is the latest Spider-Man a part-Puerto-Rican, part African-American teenager from Brooklyn, he is very much the product of public service minded working class parents. They would probably be proud of their son once they’ve come to terms with the kind of public service he is destined to provide. Miles’ father, Jefferson Davis (voiced by Brian Tyree Henry, last seen in Widows) is a policeman and his mother, Rio Morales (Luna Lauren Velez) is a nurse. Jefferson resents Spider-Man for claiming so much credit for his high-profile, selective acts of heroism, when cops on the beat have to do the job 24/7 and fill in paperwork. The Spider-Man mystique is, to a considerable extent, exposed in the film. Yes, years ago a high-school student named Peter Parker was bitten by a radioactive spider whose DNA gave the human student spider-like abilities as we know. In the comic, a girl named Cindy Moon is also bitten and finds herself with the same traits as Parker, but, as this film stresses, there are more, and they are vulnerable. Early on, Miles witnesses a (not very exciting) fight between Spider-Man (Chris Pine) and the Green Goblin (Jorma Taccone) and is disillusioned to see his hero stripped of his mask and killed. This isn’t supposed to happen! Fortunately, Spider-Man costumes are on sale from Stan’s shop and Stan’s the man (arguably the final cameo of the late Stan Lee) to sell you a non-returnable (you can only grow into them) costume. Co-producers Lord and Christopher Miller (the filmmaking duo behind blockbuster hits such as The Lego Movie and the very funny 21 Jump Street) distinguish this ground-breaking Spider-Man with its unique style. 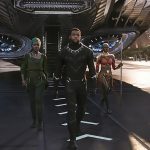 Their idea is to make the viewers feel like they are walking into the traditional comic book, with artists taking frames from the CGI animators and working on top of them in 2D, so that every frame looks like a comic panel. The process is so labour-intensive it required 142 animators to do the job. At times the comic book look is supported with actual captions in a bubble, more for effect, but with the retro colouring, it impresses. 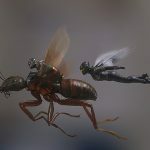 For years, the aim was to distance the films from the comic books with live action enhanced with CGI action sequences, but here the comic has reclaimed the character. As in the recent movie The Hate U Give, Miles’ parents insist on sending him to an upwardly mobile school for gifted children in a better neighbourhood, much to Miles’ chagrin. His teachers are perceptive enough to realise that Mile is intentionally doing badly to flunk out and return to his local high school. After school Miles goes to visit his uncle Aaron (Mahershala Ali, ‘Moonlight’) with whom he shares a close relationship. The flip side of his father, Aaron, AKA the Prowler, is far from being a pillar of society, but he’s not judgmental. Sensing Miles is unhappy, he takes him down a tunnel in a disused underground where, you guessed it, or maybe you didn’t, Miles is bitten by an odd-looking spider. At school the following day Miles’ growing pains are embarrassing, especially when he is trying to impress the pretty new girl in class Gwen Stacy (voiced by Hailee Steinfeld). She alone seems to find the awkward outsider, Miles, amusing. There is a reason for this affinity, of course, as Gwen is, like Miles, more than just another bright teenager. Miles is not, however, a clone. He impresses an older Peter Parker (Jake Johnson) – self-conscious about his paunch – with his ability to become invisible, although Miles, who evades arrest by his father in this manner, has not quite mastered how to control this power. But Parker is not only vulnerable to weight gain. 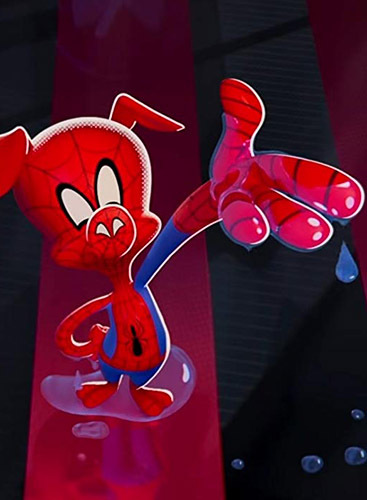 According to mad scientist Doc Ock (Kathryn Hahn), a villain along with the evil Kingpin (Liev Schreiber), if the Spider-characters do not return to their respective homes in the multiverse (called here the Spider-Verse) their bodies will disintegrate – a state expressed visually by glitching in the film. 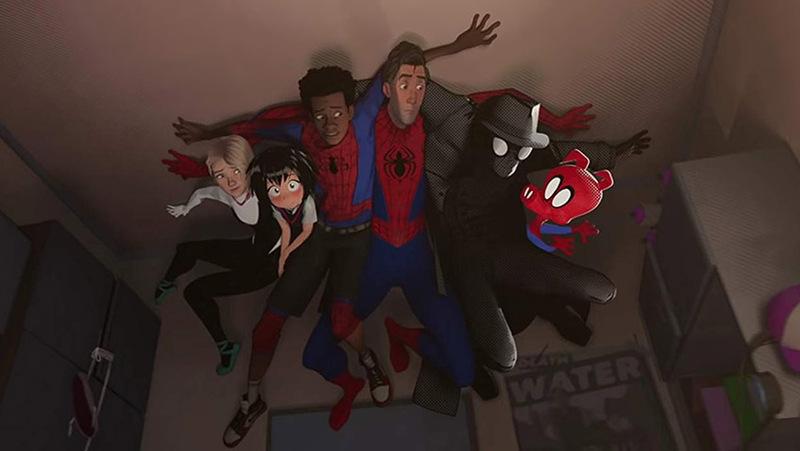 The space-time continuum is ever changing not only for Gwen and Parker, but for Spider-Ham (John Mulaney); anime style Peni Parker (Kimiko Glenn) and Spider-Man Noir (Nicolas Cage as a character out of Dashiell Hammett or Raymond Chandler). Tension about the Spider characters getting home is increased by Kingpin, a huge, almost one-dimensional suit with a thick neck and big head stuck on, who is banking on a collider bringing back his deceased wife and son –– or a facsimile thereof – through a portal in the space-time continuum. 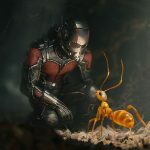 Earlier this year inventor Hank Pym executed a similar resurrection of his missing wife in Ant-Man and the Wasp. For those who have enough stamina to sit through the long end credits (always a good idea, actually), there’s a little joke in the form of Spider-Man 2099, or Miquel O’Hara (voiced by Oscar Isaac), reminding us that back in 1992 there was a already a Latino Spider-Man in the Marvel universe. The question is, will all these Spidery characters make the character more accessible or simply diminish what was special about him?